Harmonic Patterns are one of the most reliable patterns if plotted correctly. The real beauty of this pattern is that when properly identified, it enables you to enter the trade in a high probability reversal zone with minimal risk. Harmonic Trading techniques utilize Fibonacci numbers and price patterns to quantify these relationships, and provide a means to determine where the turning points will occur. The only thing one needs to understand is that it’s a rules-based method which requires discipline. Most of the price patterns are used by all the technical traders/analysts and thus are vulnerable to false breakout/breakdowns. While most of the participant doesn’t use harmonic patterns as they think its complex to understand, but in reality, it’s not. 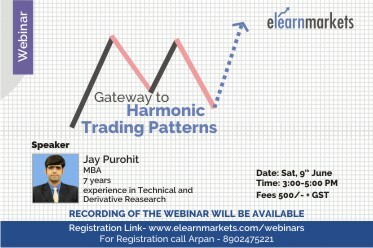 With this webinar, we will enlighten everyone about the Harmonic Trading Patterns. We are spreading knowledge on how one can trade on these rule-based patterns without emotions. They will learn to trade against the mass crowd. They will know how to rule-based pattern works with minimal risk. Participants will learn to control greed and fear (trading psychology). Attendees must have basic knowledge of technical analysis. Very basic like candlestick chart and Dow theory will do. Laptop/Desktop, High-Speed Internet and a good quality Headphone. Jay Purohit is a management graduate (MBA) and having an insightful experience of 7 years in Technical and Derivative Research. He is currently working with Centrum Broking Ltd. His forte in technical analysis is Fibonacci Harmonic Patterns, Wolfe Wave theory, RSI, Trend termination and continuation pattern identification. While his derivative analysis proficiency includes Open Interest analysis, FII Data analysis, Rollover analysis, Hedging Strategies and Option Strategies. Jay has been writing his views in various business newspapers/magazines/web portals like Dalal Street Investment Journal (DSIJ), Economic Times, DNA, Financial Chronical, Asian Age, Deccan Chronical, Divya Bhaskar, Moneycontrol, Bloomberg Quint, ET Markets, My Iris, etc. He also shares his outlook on market and stocks on various business news channels like CNBC Awaaz, Zee Business, BTVi, Bloomberg Quint and NDTV Profit. webinar was very help full...thanks a lot jay! It was a good session, with lot of practical examples and it was ensured that the basics were clear. This covered full harmonic trading concepts, not just one aspect of it. There could have been some insights from the presenter on how he traded and what learnings we could have taken home. Also, I guess it is not for Intraday traders, as all the examples were only on the daily charts. What if I don't have holding capacity for multi days? Overall, as its my first webinar, thumbs Up team!! I liked the content of the webinar...initially rules of PZR were explained which could have been covered later after the introduction of AB=CD chart pattern. Trainer has da one good job. Though I was expecting that it would cover other HM patterns but only one was covered and for some reasons, my questions were deleyed during the webinar. Thanks.